Properties in Parish Church of St. George average 4.6 out of 5 stars. 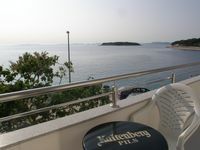 It&rsquo;s great location, very nicely furnished, nice terrace overlooking the see and old town, apartment had everything we needed. The only negative thing was that there is a food shop directly under the apartment, so the delivery trucks can be noisy. But other than this, it was perfect. And even the delivery trucks are doable because the good things outweigh this negative side of it. So I would return and recommend to others. The apartment actually looks much nicer in reality than on the pictures.